A low profile LED Par with 12x 5W Quad LED (RGB+UV) designed for uplighting, stage lighting and wall washing. With a 25-degree beam angle and 64 built-in color macros, the ADJ Mega 64 Profile Plus is great for permanent or portable lighting solutions. 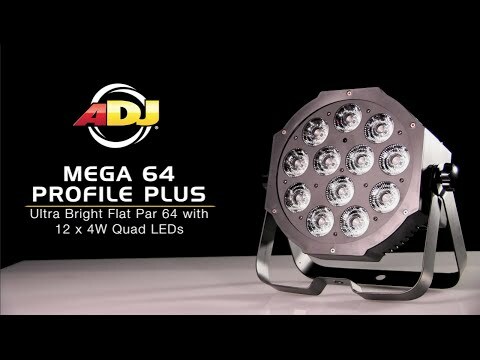 The ADJ Mega 64 Profile Plus is a compact, low profile wash fixture designed for uplighting, stage lighting and wall washing, and will bring color and excitement to any party. The Mega 64 Profile Plus is powered by twelve bright 5-Watt Quad (RGB+UV 4-In-1) LED. This Par is intelligently designed so that it may sit directly on the ground or inside truss without the hanging bracket because the power & DMX Ins and Outs sit on the side of the fixture, not on the rear. The Mega 64 Profile Plus offers smooth RGB Color Mixing with no RGB+UV shadows, has a 25-degree beam angle and has 5 DMX Channel modes for a variety of programming options. Users can also use the ADJ LED RC2 wireless remote, which is sold separately, to control the Mega 64 Profile Plus. Submit the price you are willing to pay for this item. You will receive a quick response from our crew. Easy Live ChatLower Right Corner of Site. We may message you first! Submit A Deal Request Tell us how much you're willing to pay. You'll get our best offer within 24 Hours.